Hey, here's an idea for a handmade Christmas ornament. Cut tiny plastic straws into unmanageably short lengths. Good luck with cleaning off all the dust and dog hair, too. Measure out a long arm's length of thin florist's wire. Try to not poke out your eye as you cut it off the spool. But don't worry; you can always cut the wires on your mistakes and start over. Keep some tissues nearby as you may just shed a few tears. Hold your breath through the final step, as your flat formation of triangles suddenly transforms into a three-dimensional delight. 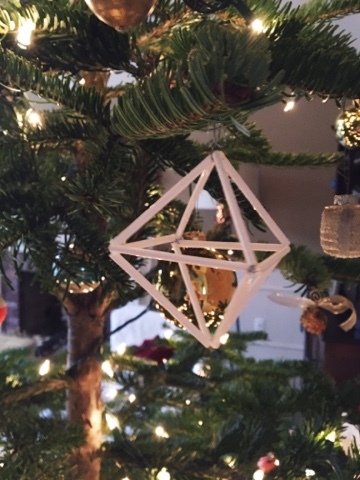 Hang it on the tree where its airy and mathematically pleasing design stands apart from every other ornament in your collection. Then sit back down and get to work. 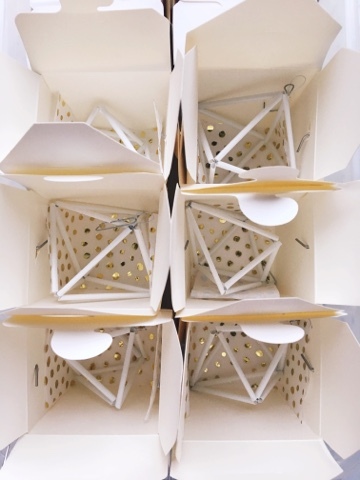 because you are going to need to make ninety-nine more of these angels before you are done. And every single one will make you smile.